The Hypercore Prime employs a 2-part system to provide a higher capacity, air travel friendly battery solution, which can be legally transported without restrictions under IATA, ICAO, and UN regulations. With a total redesign and rethinking of a greater than 98wh solution, the Hypercore Prime may be the most complete battery offering in the industry today. The battery pack can sustain larger power draws to easily handle digital cinema cameras, like the Arri Alexa, Amira, Epic, Sony F65 and Phantom. The Hypercore Prime features a higher voltage design and when coupled with the Hypercine can offer charge capacity upwards of 190wh. The higher charge voltage provides a wider discharge cycle range and greater run times. When four Prime packs are installed on the Hypercine, it provides 760wh of air travel friendly, Li-Ion power. In addition to it’s 2-part design, the battery pack was scaled vertically, to better distribute weight across the battery mount, and reducing depth by one half inch versus the older Hypercore 190 design. The new design also features a large back-lit runtime LCD on the front. An LED grid, which wraps around to the front of the battery complements the LCD, providing charge status when charging, and can be seen from afar. 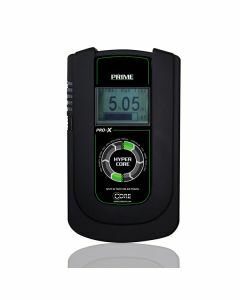 The Prime is available in V-mount and 3-mounts; and have two integrated, unregulated P-tap connections on the battery allowing you to power any 12-16.8vdc device. An additional output of a USB allows accessible charging for your mobile device. Any charger within Core SWX’ charger lineup will charge Hypercore, but the battery series is also the most cross platform, charger-compatible in the industry today. The V-mount offerings (Hypercore S) will also charge on IDXTM, SonyTM, and REDTM, allowing you to maximize service life out of your current charger.